Visual Studio Code>Programming Languages>Graphviz (dot) language support for Visual Studio CodeNew to Visual Studio Code? Get it now. 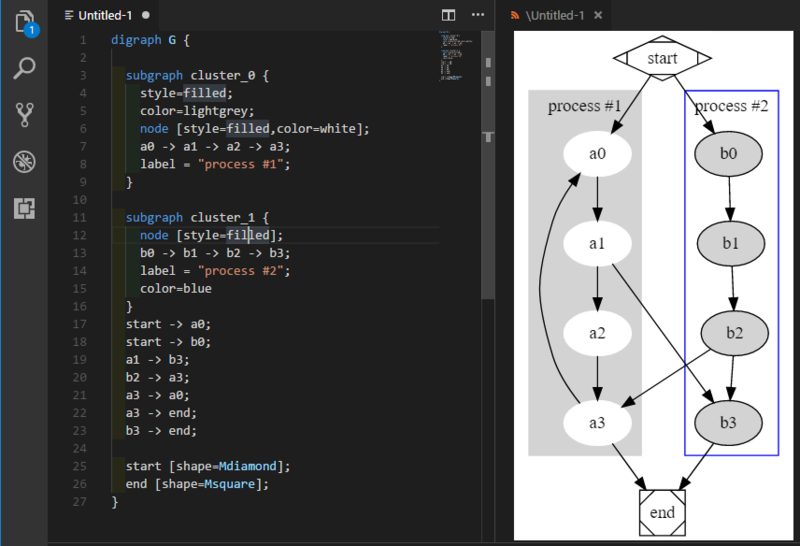 A vscode extension that provides language support and live preview for the Graphviz format. The preview uses the Viz.js library. Try typing one of the following prefixes to see available snippets: graph, >, var, dir, prop, path or rank and efficiently create graphs, variables, properties, paths or ranks. ctrl+f is supported to search for nodes/edges in large graphs, but it is best first to reset the scale to [1:1]. scaled to fit the height of the pane [↕]. This greatly facilitates viewing large graphs. Double clicking on the fit-to-width [↔] or fit-to-height [↕] buttons toggles the given mode on, so when the graph source changes, the preview scales automatically to remain visible. The zoom level value may be now set to a specific value, or gradually changed by the up/down keys on the keyboard. It is also possible to open the file in the default browser by clicking on []. This creates a temp file and asks the operating system to open it in a default browser or another capable application. When VS Code window is re-sized, the auto-scaling does not kick-in as there is no VS Code event that we can listen to. Workaround: click the button again (the toggle state does not change). After the zoom percentage is set manually, the zoom value does no longer update when pressing other toolbar buttons. However, the display continues scaling as expected. On Windows, just omit the sudo instruction. The preview uses https://github.com/mdaines/viz.js/ . The syntax highlight/snippets support is based on https://github.com/Stephanvs/vscode-graphviz .